Community Blog - How is Your Glass Collected? How is Your Glass Collected? There are a few different ways councils can go about recycling glass. The 'bringing in' system is where household recyclers sort their glass by colour and place into appropriate bins located in, say, the car park of our local supermarket. Glass does not break down in landfill, which is why we must divert it from being dumped there as long as we can. The great thing is it can be recycled over and over again. If you have the option, it’s best to recycle glass at bottle banks where you can separate colours yourself. • The UK landfills around 1,400,000 tonnes of glass each year. • 70% of landowners have kerbside collections of at least one material, however, only 34% UK households have kerbside collections of glass. 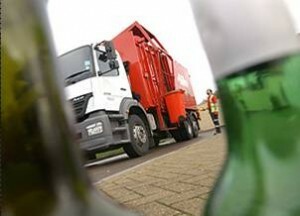 • The rate of glass recycling doubles when kerbside collection is introduced. • Commingled glass collection is less labour intensive, requires fewer trips and allows for more materials to be collected than on site-separated collections.